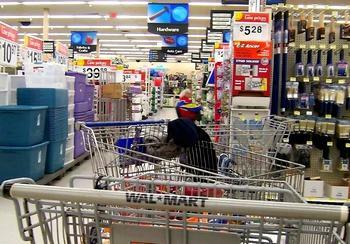 WASHINGTON, DC, May 28, 2013 (ENS) – Retail giant Wal-Mart Stores today pleaded guilty to illegally handling and disposing of hazardous pesticides at its retail stores across the United States. Hazardous wastes and pesticides returned to stores by customers were put into municipal trash bins or, if liquid, poured into local sewer systems, according to U.S. Justice Department and Environmental Protection Agency officials. Wal-Mart transported tons of these hazardous materials without proper safety documentation to one of six product return centers located throughout the United States. Wal-Mart Stores Inc. pleaded guilty in cases filed by federal prosecutors in Los Angeles and San Francisco to six counts of violating the Clean Water Act by illegally handling and disposing of hazardous pesticides at its retail stores. “Retailers like Wal-Mart that generate hazardous waste have a duty to legally and safely dispose of that hazardous waste, and dumping it down the sink was neither legal nor safe,” said André Birotte Jr., the U.S. attorney for the Central District of California. As part of a plea agreement filed in California, Wal-Mart was sentenced to pay a $40 million criminal fine. An additional $20 million fine will fund community service projects, including a new $6 million Retail Compliance Assistance Center that will help retail stores across the nation learn how to properly handle hazardous waste. Wal-Mart also pleaded guilty in Kansas City, Missouri to failing to properly handle pesticides that had been returned by customers at its stores across the country, in violation of the Federal Insecticide, Fungicide and Rodenticide Act, FIFRA. Starting in 2006, Wal-Mart began sending damaged household products, including regulated solid and liquid pesticides, from its six return centers to Greenleaf LLC, a recycling facility located in Neosho, Missouri, where the products were processed for reuse and resale. Because Wal-Mart employees failed to provide adequate oversight of the pesticides sent to Greenleaf, regulated pesticides were mixed together and offered for sale to customers without the required registration, ingredients, or use information, in violation of FIFRA. Between July 2006 and February 2008, Wal-Mart trucked more than two million pounds of regulated pesticides and other household products from its various return centers to Greenleaf. In November 2008, Greenleaf was convicted of a FIFRA violation and fined $200,000. As a result of the three criminal cases brought against Wal-Mart by the Justice Department, as well as a related civil case filed by the U.S. EPA, Wal-Mart will pay $81.6 million in‌ penalties. Coupled with previous actions brought by the states of California and Missouri for the same conduct, Wal-Mart will pay a combined total of more than $110 million to resolve cases alleging violations of federal and state environmental laws. “Truckloads of hazardous products, including more than two million pounds of pesticides, were improperly handled under Wal-Mart’s contract,” said Tammy Dickinson, U.S. attorney for the Western District of Missouri. Wal-Mart owns more than 4,000 stores nationwide that sell thousands of products which are flammable, corrosive, reactive, toxic or otherwise hazardous under federal law. The products containing hazardous materials include pesticides, solvents, detergents, paints, aerosols and cleaners. Once discarded, these products are considered hazardous waste under federal law. In conjunction with today’s guilty pleas in the three criminal cases, Wal-Mart has agreed to pay a $7.628 million civil penalty that will resolve civil violations of FIFRA and Resource Conservation and Recovery Act. In addition to the civil penalties, Wal-Mart must implement a comprehensive, nationwide environmental compliance agreement to manage hazardous waste generated at its stores. The agreement requires personnel training at all levels of the company in identification and management of hazardous wastes and establishment of Environmental Management Systems at Wal-Mart stores and return centers. Compliance with this agreement is a condition of probation in the criminal cases. These cases are the result of investigations conducted by the FBI and the EPA, with assistance from the California Department of Substance and Toxics Control and the Missouri Department of Natural Resources.